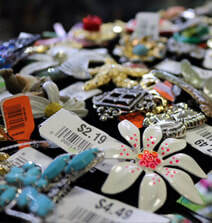 If you’ve been inside an EcoThrift, you know right away there’s something different about us. One difference: From the start, we’ve invested in research and development for new ways to deliver huge quantities of great items at remarkable prices. Another difference: The vast inventory in each store completely turns over every 28 days. If you haven’t been by in a month, you won’t find the same stuff. Our planet’s economic engine creates incomprehensible wealth. But it’s inefficient. Perfectly good used items fall through the cracks daily, serving no one and no purpose. Countless resources end up in landfills. For more than 30 years, we’ve helped save massive wealth from oblivion by providing a vast and vibrant meeting point of sensible consumption. A garment, book, toy or gardening tool can have even more meaning to its second owner than the original one who purchased it. Trading in the flotsam and jetsam of our culture, we sustain ourselves and our environment. For our communities, we add value and coordinate opportunity. As a result, more abundance goes to more people.